Currently viewing the tag: "discipline"
Anybody who knows me is aware of my voracious appetite for reading biographies. I especially love learning about the difficulties great people have faced, and overcome, on their journeys. Whether talking Confucius, Sir Issac Newton or Jesus Christ, I relish the fact that every life, big or small, has obstacles to surmount. Why do I appreciate a good tale of conquered summits? Because it helps me walk through my own cross-bearing; it reminds me that every challenge I face is a part of my history. What will become of my legacy as it reveals itself from the fog of the great unknown? That’s the most exciting thing about life as we live it—we just have no freakin’ idea. When it comes to conquering the chaos of uncertainty with poise, honor and nobility, I find no story more uplifting than General George Washington’s experience commanding the Continental Army during the American Revolution. If you do not know this story more than your faded recollections of high school history, do yourself a favor and pick up a copy of Joseph J. Ellis, His Excellency, George Washington. I read this book the year of its publication, 2004, on a whim, simply because I saw it in a bookstore and it spoke to me energetically, or called me over, so to speak. This book could not have been more appropriately titled because excellence is the only word that truly does Washington justice. He was excellence incarnate. But more important is his story, his role in the American War of Independence, which is the perfect metaphor for what we all face at one time or another in our lives: Dire circumstances, on the verge of catastrophe, up against forces well beyond our capacity to handle, totally unprepared, ill-equipped, and without resources, yet through a sense of purpose, tenacity, grit, and some unexpected good luck, we can make it through, forging a whole new entity, nation or paradigm along the way. George Washington’s story is every person’s story who has ever tried to build, lead or change something in their lives. And like the General, if you can survive, you will probably succeed and thrive. How did he do it? How did George Washington manage to keep afloat during such dismal and uncertain conditions? I will present to you here what I believe were Washington’s key characteristics, ones I think we can all benefit from when putting them into action during our own turmoil. The thing you must understand about what we discuss here is the general air of the time in 1775, when Washington had been appointed commander of the Continental Army. 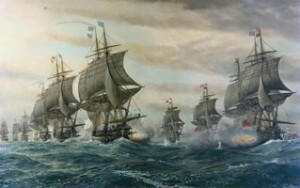 The British were the greatest Colonial power in the world, with a devastating navy. They were mega-wealthy—their colonies brought in vast sums of money, of which they used to finance their war machine. They had spent an entire century fighting (and beating) their neighbors and colonial rivals of Western Europe; they were experienced, tough and disciplined. Washington’s military, on the other hand, was comprised of amateurs—”the middling sort”—as Ellis describes them. They were at times undisciplined, unpaid and without supplies or clothing. Congress at times meddled where it shouldn’t have, and was often powerless to help—money, supplies and food were in severe shortage. 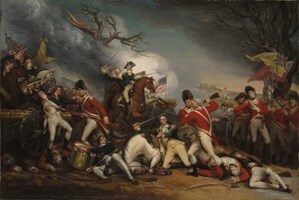 Despite some early successes, the Continental Army had suffered severe setbacks in New York and New Jersey. To say the colonies, public and military were riding low would be an understatement. To say General George Washington was in a bleak situation, a state of darkness, in which he could not be entirely certain of how events would unfold, would still only be touching the tip of the iceberg as to what he must have been experiencing. But it all came to a head during the winter of 1777-1778, at Valley Forge, in Pennsylvania—where the Continental Army was holed-up, riding out the severe cold. The men were wracked by starvation, disease and malnutrition. He had colossal staying power — this is the hardest thing for people to keep in mind. Just stick it out—time really is on the side of those who can tough out the storm. 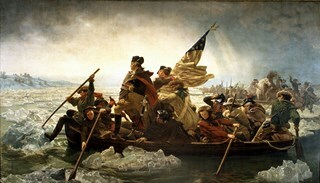 Washington rode out six long years of war—that’s no home, no family, no rest, no peace, no quiet, no partying for 72 months! Nothing. Nada. Zilch. Zero. Some people get thrown if they have a few bad weeks. If you want to succeed at any life change or endeavor, sticking out the tough (and sometimes all-out-freakin’-abysmal) times is tantamount to victory. Tides turn over time, and you can be assured that your down-slide will turn to an upswing sooner or later. Amazing things happen to those patient enough to wait; loss is only guaranteed if you throw in the towel. Stick it out like a Continental. He did not let his inexperience or “not knowingness” distort his mission — Up to the time of his appointment, George Washington never commanded a large conventional army. He only knew what he had learned from military books, and by observing British commanders under whom he had served as a young man, but he did not let this cloud his sense of purpose (dharma), or keep him from going full force into the unknown. Too many of us cower under the nightmares we create in our minds over not being experienced, talented, smart, young, blessed or lucky enough to make the grade. You are never going to be one hundred percent ready to take any leap—heck, you might just find yourself in utter chaos brought about by nature itself: sink or swim time. While being prepared for what you can anticipate is one of my mantras, carrying on, despite your greenness, will take you to heights unanticipated. So fight through fear, and focus forward—it’s the only way to fly, anyhow. He held steadfast through several demoralizing defeats — With his troops battered and beaten, without clothes or shoes, their Marches of Patience “traced by the Blood from their feet,” the General pushed onward, with a certainty that is needed to overcome any monumental obstacle. Certainty in this case is not of how things will unfold, but of the laser-focus discipline necessary to complete one’s destiny. We have all had to withstand demoralizing times, but when these come one after another, it takes real strength of will to maintain one’s sense of purpose. That is why I say it is important to be in-tune with one’s dharma or life’s purpose, because this is what drives us through the blizzard, battered and bloodied, with or without shoes. When our strength of purpose is greater than outward conditions, we conquer. He was bold, creative and unorthodox — Washington did what was needed at all times of dismal uncertainty, and he did things differently. His bold moves completely perplexed the British army who thought they had the “old fox” trapped. He made the most of what he had, which was very little by way of supplies, artillery and even food. And while most armies would rest after battle, Washington had his moving, bringing them to safety, while their opponents slept. When we are in our own turmoil, nothing is more powerful than movement, action, and novelty. The harshest of times are what lead to innovation and new ways of doing things. If necessity is the mother of invention, then chaos is the father of efficiency. We so often learn to do things in a better way when we have just got to do something, anything, fast. Take your own dire circumstances as an opportunity to try new things, especially if you have lost money, resources or people, and you have got nothing much else left to lose. Get crazy; get creative—you will be surprised at what you come up with. He dealt with the worst conditions, and learned from them — Nobody has had worse conditions than the Continental Army during the Revolutionary War. Shortages of men, shoes, shirts, blankets, and gunpowder would have crippled most men into impotency, but not Washington who powered on. As Ellis put it, “The lesson Washington drew from that experience, learned not from books but from struggling on a day-to-day basis, was that the meaning of the Revolution…had been transformed during the course of the war.” Persistence, certainty, and tenacity are crucial elements during the toughest of times, but most important is what you learn from moment-to-moment. Too many of us keep our blinders on during tough times, when in fact our eyes should be the most open. What did you learn from each of your experiences? What was the upside to the downside, and vice versa? What can you be grateful for each day? Write it down, don’t mind-eff it—every day, write down and meditate on what you are grateful for. Focus on that. 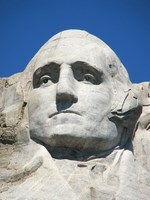 He stayed true to his principles — Washington was no pushover. He loved and respected his men, for sure, as his many letters advocating on their behalf showed how deep his admiration. 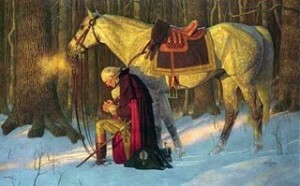 But make no mistake about it, the General stayed true to his position as leader and commander; he demanded discipline. 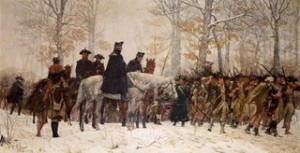 He relieved officers of their duty if they showed dullness, cowardice or insubordination of any sort; he would string up deserters, and order “one hundred lashes to their bare backs for minor infractions.” Washington was driven by a profound purpose, and he knew his role within the dynamic. Know your role, and play it out to the fullest, to the best of your abilities, and without looking for reward or recognition. Doing things in this way will allow you to complete your mission without getting side-tracked by low-priority distractions or irrational emotions. He did not attach to his perspective — Perspectives are relative, and attaching too firmly to any one closes you off to greater possibilities. 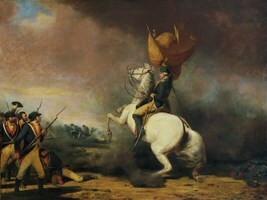 Washington was generally firm in his convictions, but he was also able to let go, and in so doing, allowed his cause to unfold into its ultimate victory. Despite his stubbornness in wishing to attack the British again in New York, he relinquished to the French plan to attack in Virginia, where the French fleet was prepared to drive the British out of Chesapeake Bay. 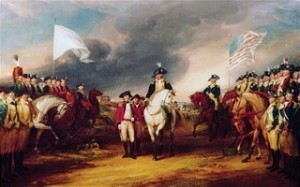 Washington’s giving in to a different perspective and path led to the decisive victory in the war. We simply cannot know everything, and more often than not, it is the unknown that holds the final solution, not the known, so let go when time calls for it (you will feel it intuitively). The exciting mysteries of life unfold in the space of the unknown. Trust in the process. Trust in the universal forces of destiny, and watch your cause manifest even better than how you envisioned it. This is a universal truth illustrated beautifully by Washington’s history in the war. As I said, we can look to General George Washington not only as the father of America, but as an avatar on how to handle our own internal wars, and our external Valley Forges. By practicing discipline, confidence, tenacity, persistence, certainty, creativity and flexibility, we too can overcome the most dismal of circumstances, and create the change we have been working toward. Whether we are talking financial struggles, relationship struggles, challenges with children, or complete life-makeovers, just remain mindful of the traits Washington (and the entire Continental Army) exhibited during the Revolutionary War. We all must enter battles, survive wars, and carry crosses. How we come out on the other side depends directly on how we commit to walking through them. Be like the General and do it with purpose and conviction, and watch your destiny evolve in excellence.